Relax poolside from the comfort of this beautifully refurbished 2 bedroom Townhouse in Noosaville, just a short walk to the Sunday Farmers Market, or Noosa River on Gympie Tce. Resort style setting with swimming pool and BBQ onsite. 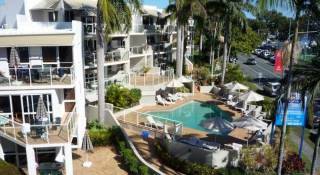 Enjoy a luxury break in the heart of Noosaville at Pelican Cove Resort, Relax poolside from the comfort of this beautifully refurbished 2 bedroom Townhouse in Noosaville, just a short walk to the Sunday Farmers Market, or Noosa River on Gympie Tce. Resort style setting with swimming pool and BBQ onsite. 2 bedroom plus study fully equipped townhouse situated just 10 mins to Hastings Street and Main Beach, located opp Quamby place, direct water access to the Noosa Sound Canals, Swimming pool, Water Views from Master Bedroom and upstairs deck. LIMITED TO 1 SMALL DOG Please call before booking Pet fee $50 per stay applies. "Moondarah" This 2 bedroom fully self-contained Townhouse is an ideal getaway for families. 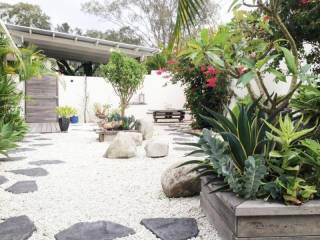 It features brand new ensuite, a modern kitchen and spacious living area, Foxtel TV and WIFI it also has a large courtyard . 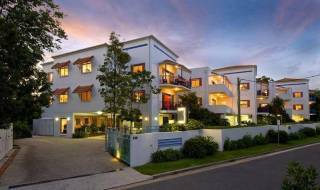 This Deluxe Townhouse, is set in a complex of 7 units with a swimming pool and is only a 10 minute flat walk to Hastings Street and the Main beach. It is 50 metres from the "Noosa Wharf " which features fine restaurants a collection of shops and the Jetty. City To Surf Rentals are the managers for the holiday apartments available. 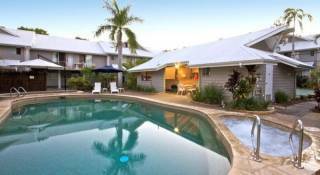 Noosa Terrace, Moondarah & Belmondos are the ultimate accommodation choice for all travellers. Noosa terrace boasts stunning water views with its own private beach, direct access to the canal and a saltwater swimming pool in lush tropical surroundings. whether you're travelling for business or leisure, any of our fully self catering apartments are the perfect choice. Noosa Terrace offers a choice of spacious two bedroom Townhouses with direct beach and canal access to the water, each fully self-contained with a modern kitchen, private courtyard, sundeck and car parking space. Belmondos are two-bedroom fully self-contained apartment, ideally situated just a short stroll to Hastings Street and Main Beach. Belmondos also features a swimming pool and barbeque area. Belmondo's unit 1 - this is a luxury gound floor family apartment with ample secure outdoor space, ideal for young children. Belmondo's unit 3 - This is an upstairs apartment featuring 2 bedrooms and an ensuite. "Moondarah" "PET FRIENDLY" These fabulous 2 & 3 Bedroom Deluxe Townhouse's, are set in a complex of 8 units with its own swimming pool, and are only a 7 minute flat walk to Hastings Street and the Main beach, they are 50 metres from the "Noosa Wharf " which features fine restaurants a collection of shops and the Jetty.These are an ideal getaway for the whole family including your "PET" "Moondarah" Unit 6 - 3 Bedroom Townhouse, fully self-contained featuring air-conditioning, flat screen T.V.DVD & CD player, Austar TV, Dishwasher, Microwave and also has full laundry facilities. The bedding configuration is 2 Queens and 2 Singles which can also be made into a double. PET FRIENDLY Moondarah Unit 7 - This 2 bedroom fully self-contained Townhouse, features 2 bathrooms, modern kitchen and spacious living area, flat screen T.V.DVD & CD player, Austar TV, Dishwasher, Microwave and also has full laundry facilities. Bedding configuation 1 Queen & 2 Singles and a pull out lounge.Internet access Air Conditioning. PET FRIENDLY PLEASE NOTE currently there is NO offstreet parking for Townhouse 7 At Moondarah, parking is on the street. "Moondarah" 3 Bedroom Townhouse, set in the same complex as the "Pet Friendly" townhouse, offering the same facilities but with NO PETS ALLOWED. NB No Air-Con. All the Townhouse's have a balcony,large court yard and free undercover parking. In Noosa Terrace each unit is allocated one one undercover parking space . In Belmondos each apartment has a lock up garage. There is also plenty of on street parking. In Moondarah each Townhouse is allocated one undercover parking space Townhouse 7 at Moondarah currently has NO offstreet parking, however there is plenty on the street or the onsite visitors park if available. Noosa Terrace, Belmondo's and Moondarah is in a prime location, situated directly opposite "Noosa Wharf", featuring fine restaurants, and a supermarket. Noosa is one of the top tourist destinations on the Sunshine Coast, known primarily for its sophisticated dining, great surfing beaches and spectacular national parks. This magnificent Sunshine Coast Region boasts spectacular beaches, mountain ranges and the rolling green hills of the hinterland. Walk through lush rainforests, observe the abundant native wildlife, or enjoy a picnic beside a secluded river. Noosa has a reputation for its relaxed holiday lifestyle and idyllic climate. The Noosa River is a playground for the water enthusiast and nature lover, and has become one of the most pristine waterways in Australia. The river flows through the Cooloola and Great Sandy National Parks and is bordered by unspoilt bushland, rainforests and majestic foreshores. The Noosa River offers a huge range of activities; - Fishing; whiting, bream, flathead and mud crabs - Year round swimming - Bush walking - Beach access - Kite Surfing - Everglade Tours - Water Skiing - Jet Skiing - Reef Fishing - Bird Watching - BBQs and Picnics - Cruising - Sunsets and sunrises - Easy access to Hastings Street and Gympie Terrace and many restaurants At the northern end of the beach the Noosa River flows into Laguna Bay, the Noosa River is a great place to relax and unwind. The promenade along the river is a favourite gathering place for locals with picnic grounds, play ground for the kids, and great B.B.Q facilities. On the riverfront are a number of hire outlets, which will hire just about anything you can think of. From small tinnies (aluminium boats) for fishing, catamarans, jet skis, roller blades and other sports equipment, all needs are catered for. Full payment must be made prior to arrival, check in procedure will be emailed to you and/or sent as a txt, there is no onsite office so you will be notified of the key collection details closer to your arrival date. All Rates are based on 2 persons sharing a Queen or Double bed! Extra guest charge of $10.00 per person per night. (Max $30.00 per week). Children under 10 are free. Bookings require a $200 deposit to secure, full payment is required 5 days before your arrival, we accept visa and mastercard, you can also pay by direct credit to our Australian bank account, please enquire at time of booking for details. We do not accept bookings from large party groups and schoolies. Any cancellations prior to 2 weeks of your stay will forfeit your full deposit. Cancellations made less than 1 week of your stay will not be refundable unless we are able to rebook your allocated room for the same dates, in this instance we are happy to refund your payment less a $100 admin fee. PLEASE NOTE CHECK IN IS STRICTLY 2PM, if you require earlier check in please ask us so we can try t have it arranged for you. Noose Terrace & Belmondos is accessible by Train, Car, Bus. There is a bus stop directly opposite the complex at "Noosa Wharf". 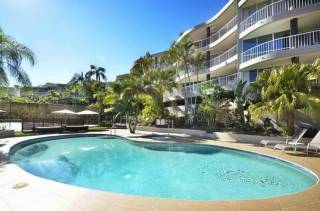 It is only 30 minutes by car from Maroochydore Airport and 1hr 30 minutes from Brisbane Airport. Transfers from Sunshine Coast & Brisbane Available through various airport shuttle companies.